Analyzing the current ratio and debt-to-equity ratio for these companies shows that they're relatively equally matched, but investors might still want to approach them with caution. Merck (NYSE:MRK) and Eli Lilly (NYSE:LLY) recently announced that they're expanding their cancer collaboration, and given the opportunity, investors may be wondering if one of these pharmaceutical giants is a better buy than the other. With that in mind, I dug into the balance sheet of these two companies looking for insight and discovered that it may be worth taking a wait-and-see approach to both of these stocks. Read on to learn why. Balance sheets provide a static snapshot of a company's assets and debts at the end of every quarter, and thus they give investors insight into whether a company can pay back creditors if they come knocking. Balance sheets are broken into three parts: assets, liabilities, and shareholder equity. In the assets section of a balance sheet, companies list their short- and long-term assets. Short-term assets are assets like cash or inventory that can be tapped in a year or less, while long-term assets are things like real estate that are less liquid. The liabilities section of a balance sheet is similarly broken out by short- and long-term liabilities with the short-term section including items like accounts payable and any debt that needs to be paid in the coming year. Long-term liabilities include items such as debt due in more than a year. Finally, the shareholder's equity portion of a balance sheet shows how much net income is left over after any dividends are paid by the company (retained earnings), how much capital investors have invested in the company, treasury stock, and other equity items. Exiting the third quarter, Merck has $7.5 billion in cash and equivalents, $4.5 billion in short-term investments, and another $13 billion in long-term investments. It also has $2.5 billion in short-term debt and $24.1 billion in long-term debt. Meanwhile, Eli Lilly has $3.2 billion in cash and equivalents, $1.1 billion in short-term investments and $4.1 billion in long-term investments. It also has $9.3 million in short-term debt due and $8.1 billion in long-term debt. While those absolute numbers are interesting, comparing them doesn't make much sense because Merck is a much larger company. Instead, it makes more sense to use ratios to see which of these companies is financially healthier. First, let's consider the current ratio, which divides a company's current assets by its current liabilities. The current ratio shows you if a company is able to cover its near-term financial obligations. Typically, a ratio above 1 is desirable and the higher the ratio the better. However, there is one caveat: If a ratio is too high, it could signal that a company isn't finding any good way to use its cash to boost future growth. In the case of these two companies, Merck's current ratio is 1.63 and Eli Lilly's is 1.51. Since both of these ratios are above 1, both companies are in fine financial shape. However, it's Merck that has the edge. It can also be helpful to use the balance sheet to consider how levered a company is relative to shareholder equity. Companies with a high debt-to-equity ratio could be riskier to own because if business sours it could be more difficult to pay back debt. Merck's debt-to-equity ratio is 58.38% and Eli Lilly's debt-to-equity ratio is 53.01%. Since Eli Lilly has a lower debt-to-equity ratio than Merck, it may be slightly less risky. Investors can also gain insight by considering how certain items, like debt or cash, on the balance sheet are trending. If debt is growing and cash is shrinking, it may warrant digging deeper before buying shares, but if debt is falling and cash is climbing, then it could signal a company is firing on all cylinders. 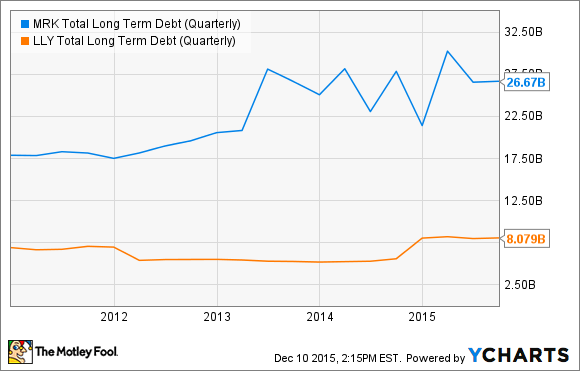 Unfortunately, total long-term debt has been increasing over the past five years for both of these companies. MRK Total Long Term Debt (Quarterly) data by YCharts. And cash on the books has been sliding. MRK Cash and Equivalents (Quarterly) data by YCharts. Often, debt increases and cash decreases when companies orchestrate M&A, and that appears to be the case with both of these companies. In 2014, Merck bought antibiotics drugmaker Cubist for $8.4 billion and hepatitis C clinical drug developer Idenix for $3.85 billion, and Eli Lilly acquired the animal health business from Novartis for $5.4 billion. Acquisitions, however, aren't the only reason why debt is climbing and cash is shrinking for these companies. In 2011, Merck lost patent protection on its $13 billion per year cholesterol drug Lipitor and it's struggled to replace revenue that has since been lost to generic competitors. Similarly, Eli Lilly lost patent protection on its $5 billion per year antidepressant Cymbalta in 2013 and its $1 billion per year Evista in 2014. Competitive threats, patent expirations, and high trial-failure rates mean investors shouldn't rely solely on top-selling products and promising pipelines when considering whether or not to buy a big pharmaceutical stock. Investors should also consider the financial health of companies to make sure they've got the staying power to deserve a spot in long-term portfolios. 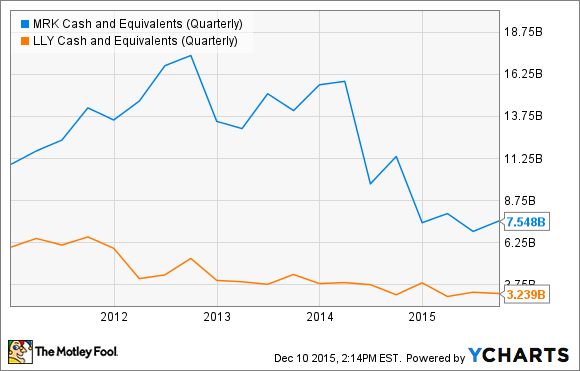 At these two companies, the balance sheet battle appears to be a draw. Merck has a better current ratio, while Eli Lilly offers a better debt-to-equity ratio. Neither company is seeing debt fall and cash climb. Although both companies appear to be financially sound, debt and cash trends suggest approaching them with caution. It will be a while before the investments made by these companies pay off with profit that can be used to pay down debt and boost cash again, so a wait-and-see approach may be best.